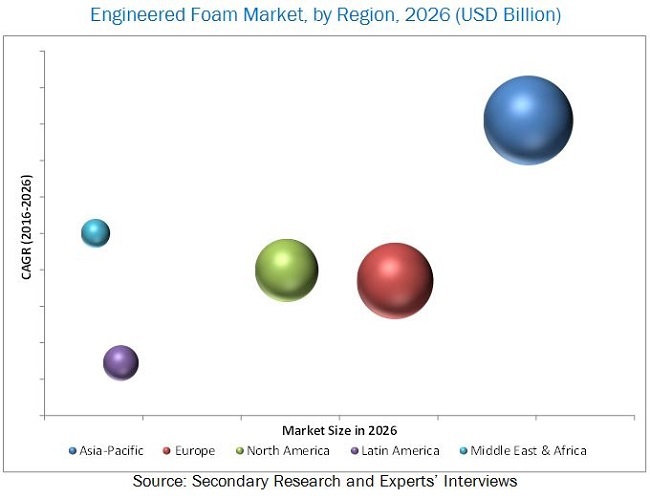 [190 Pages Report] The global engineered foam market was estimated at USD 57.30 Billion in 2016, and is expected to reach USD 122.30 Billion by 2026, at a CAGR of 7.9% from 2016 to 2026. The global engineered foam market has been segmented on the basis of form, type, end use industry, and region. The base year used for company profiles is 2015; where the information was not available for the base year, the prior year was taken into consideration. Different secondary sources, such as company websites, directories, and database such as Hoovers, Bloomberg, Chemical Weekly, Factiva, RadTech, and other government and private websites, have been used to identify and collect information that is useful for this extensive commercial study of the global engineered foam market. The primary sources, which include experts from related industries, have been interviewed to verify and collect critical information as well as to assess the future prospects of the market. The top-down approach has been implemented to validate the market size. With the data triangulation procedure and validation of data through primaries, the exact values of the overall parent market size and individual market sizes have been determined and confirmed in this study. The breakdown of primaries conducted in shown in the figure bellow. The ecosystem for the global engineered foam market consists of suppliers of key raw materials, such as polyol, polyurethane, polyethylene and other chemicals. Many companies, such as BASF SE (Germany), The Dow Chemical Company (U.S.), Bayer AG (Germany), Sekisui Chemical Co. Ltd. (Japan) have adopted forward integration to promote various materials. The demand side includes companies from aerospace & defense, transportation, medical & healthcare, manufacturing & construction, and other industries, which uses engineered foam for various applications including cushioning, insulation, and others. The global engineered foam market is projected to reach USD 122.30 Billion by 2026, at a CAGR of 7.9% from 2016 to 2026. High transition along with shorter product life cycles in end-use industries is another factor expected to drive the engineered foam market. Increase in the number of developments in the construction, sports & leisure, and automotive industries is also expected to further boost this market. Aerospace & defense, followed by the medical & healthcare segment dominated the global engineered foam market in 2015. The transportation segment is projected to grow at the highest CAGR during the forecast period. This high growth is attributed to the use of high-power engines with higher calorific value fuels for better combustion. The growth in medical & healthcare segment is attributed to the emerging healthcare sector; and the requirement for precision medical equipment. The major factors that are expected to drive the demand for engineered foam during the forecast period include increasing aging population, increased shift towards technologically advanced products and others. Aging population is one of the frequent consumers of the wound care products and medical devices & components. Another factor expected to drive the market is the increased healthcare expenditure by the countries across the globe and their contribution to the overall GDP. In terms of material type, global engineered foam market is segmented into, polyurethane, polyvinylchloride, polystyrene, polyolefin, and others. The polyolefin segment is expected to grow at a highest rate during the forecast period. Olefins or alkenes are defined as unsaturated aliphatic hydrocarbons. Polyolefin foam is another type of polymer foam, which is majorly used in the packaging and automotive industries. These are macromolecules formed by the polymerization of olefin monomer units. Asia-Pacific estimated to lead the global engineered foam market in 2016. The Asia-Pacific engineered foam market is expected to witness high growth during the forecast period, owing to increasing demand from countries, such as Japan, China, India, Indonesia, and others and increasing manufacturing and infrastructural activities in the region. Some of the factors that may restrain the growth of the market includes stringent norms and regulations imposed on the use of medical grades products that require high R&D expenditures and others. BASF SE (Germany) is one of the most active players in the global engineered foam market. The company expanded its business in different regions to increase its global reach and cater to the diversified demands of its customers. The company also entered into joint ventures to strengthen its market position in various region. Armacell GmbH (Luxembourg) is another key player in the market that undertook diverse growth strategies to achieve growth. 12.5 Sekisui Chemical Co., Ltd.